With so many companies posting lowered guidance you have to love one that beats and raises guidance. Business is good for PayChex. Paychex, Inc. provides payroll, human resource (HR), retirement, and insurance services for small to medium-sized businesses in the United States and Europe. The company offers payroll processing services; payroll tax administration services; employee payment services; and regulatory compliance services, such as new-hire reporting and garnishment processing. It also provides HR outsourcing services, including Paychex HR solutions comprising payroll, employer compliance, HR and employee benefits administration, risk management outsourcing, and the on-site availability of a professionally trained HR representative; and retirement services administration, including plan implementation, ongoing compliance with government regulations, employee and employer reporting, participant and employer online access, electronic funds transfer, and other administrative services. In addition, the company offers insurance services for property and casualty coverage, such as workers' compensation, business-owner policies, and commercial auto, as well as health and benefits coverage, including health, dental, vision, and life; cloud-based HR administration software products for employee benefits management and administration, time and attendance, recruiting, and onboarding solutions; and other HR services and products, such as employee handbooks, management manuals, and personnel and required regulatory forms. Further, it provides various accounting and financial services to small to medium-sized businesses comprising payroll funding and outsourcing services, which include payroll processing, invoicing, and tax preparation; and various services, such as payment processing services, financial fitness programs, and a small-business loan resource center. The company markets its products and services through direct sales force. Paychex, Inc. was founded in 1979 and is headquartered in Rochester, New York. Company description from FinViz.com. The company reported earnings of 65 cents that rose 20.4% and beat estimates for 63 cents. Revenue of $858.9 million rose 7% and beat estimates for $855 million. Free cash flow from operations was $223.5 million. They paid $201.3 million in dividends in the quarter. The annual dividend is $2.24 or a 3.12% yield. For 2019 the company guided for 18% to 20% revenue growth in PEO and insurance services and 4% growth in management solutions. Interest on funds held for clients is expected to rise by 20-25%. Earnings are expected to rise 11-12%. During the quarter they announced a deal to acquire Florida based Oasis Outsourcing for $1.2 billion in cash. That is expected to bolster the company's PEO strategy an expand PEO sales and the client base. PEO stands for professional employer organization. This is where they provide all types of HR solutions to small businesses. 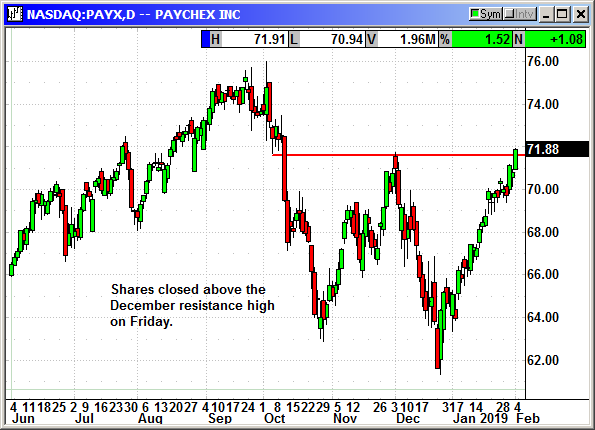 Shares have moved up steadily from the December low and broke above December 3rd resistance high on Friday. The next target is $75 and the October high. With strong earnings, guidance and dividend, shares should continue to be in favor. The March options cycle expires 5 days before earnings, so we have to reach out to June to prevent premium erosion ahead of earnings. Buy June $75 call, currently $1.90, stop loss $68.65.